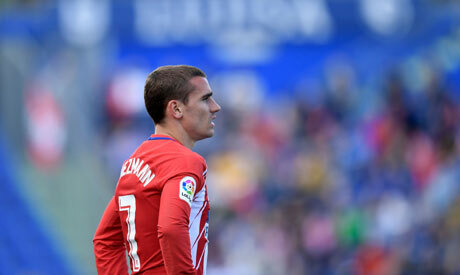 Antoine Griezmann's uncertain future has threatened to overshadow Atletico Madrid's preparations for the Europa League final and all eyes will be on the French forward when his side take on Olympique de Marseille in Lyon on Wednesday. Griezmann has been Atletico's most significant player over the last four seasons but he has had an uneasy relationship with the club in the last year and is widely expected to move to Liga champions Barcelona at the end of this campaign. Atletico released a statement last week saying they were "fed up with Barcelona's attitude" after president Josep Maria Bartomeu admitted he had spoken with Griezmann's agent and striker Luis Suarez said he welcomed the Frenchman's immminent arrival at the Nou Camp. Griezmann has been Atletico's top scorer in every season since joining from Real Sociedad in 2014 but a constant stream of transfer stories in the last year linking him with clubs from Manchester United to fierce local rivals Real Madrid has led to him being booed by his own supporters. The France international has got fans back on his side with a resurgent run of form since January and he grabbed the vital away goal in the Europa League semi-final first leg 1-1 draw at Arsenal which paved his team's way to reaching the final. However, the recent spate of stories about Barcelona being ready to pay his 100 million euros ($120 million) buyout clause have refocused attention for the wrong reasons, and Atletico players have been peppered with questions about his future. "We cannot control things like this, all we can do is help him to feel good with us," said Atletico captain Gabi. "He is a very important player for us and he could play in any team in the world. The only thing we can hope for is that he has a great final and wins us the trophy." Griezmann has only managed to win one trophy with Atletico, the 2014 Spanish Super Cup against Real Madrid, having lost the 2016 Champions League final to Real on penalties after hammering the crossbar from the spot during the 1-1 draw in Milan. He could hardly have wished for a better setting for his next European final than the Groupama stadium in Lyon, an hour's drive from his home city Macon and where he scored two goals for France in a 2-1 win over Ireland in the last-16 of Euro 2016. The striker also has the ideal opponents in Marseille, having told newspaper L'Equipe this month that he had hoped all season long Atletico would be drawn with his compatriots, who he considers to be a bigger club than Ligue 1 champions Paris St Germain. Team mate Saul Niguez, however, believes only one thing will be on Griezmann's mind in Lyon. "He'll be extra motivated but not because he's playing near his city but because he's anxious to win a trophy and to be important," said the midfielder. "In this final he has to prove himself and take a step forward.